Brintons have manufactured most of the carpets that I have designed for over 80 theatres, beginning with the Crucible in Sheffield in 1971. My design consultancy, Clare Ferraby Designs, has been responsible for the restoration or reinvention of the interiors of all eight of Sir Cameron Mackintosh’s heritage listed theatres in London; Brintons have been involved in all of them. 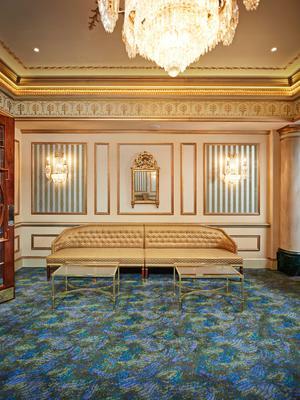 I develop an appropriate series of carpet designs for the various public spaces in each different theatre, through painted images that reflect the particular characteristics of the space and its original architect. After agreement with Cameron, the preferred options with my selected tuft choices are digitised by Brintons into various manufacturing solutions. The preferred options are then sampled, tuft colours are adjusted, and layouts are produced to suit the differing designs for the range of complex spaces, all before a decision is made to manufacture. 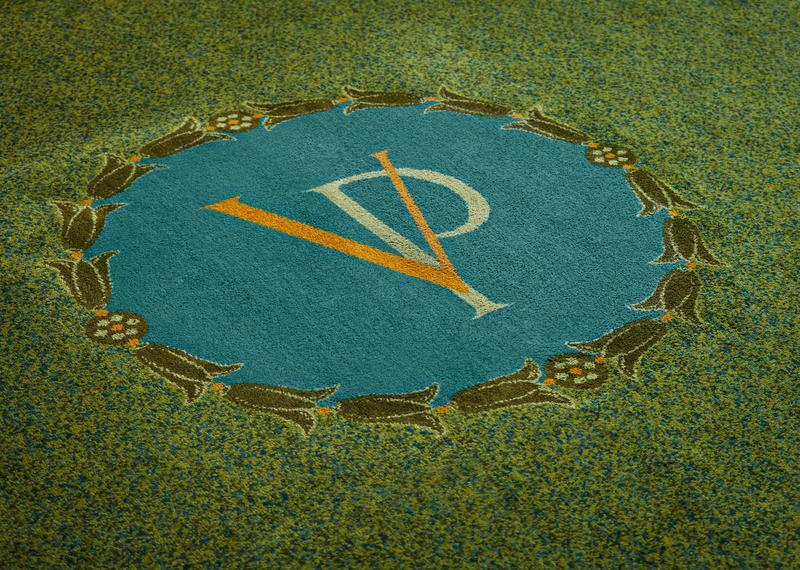 The Victoria Palace refurbishment was particularly successful as Brintons were able to fully understand my concept of creating the feel of Viennese Seccessionist Design that was appropriate for a building originally opened in 1911. 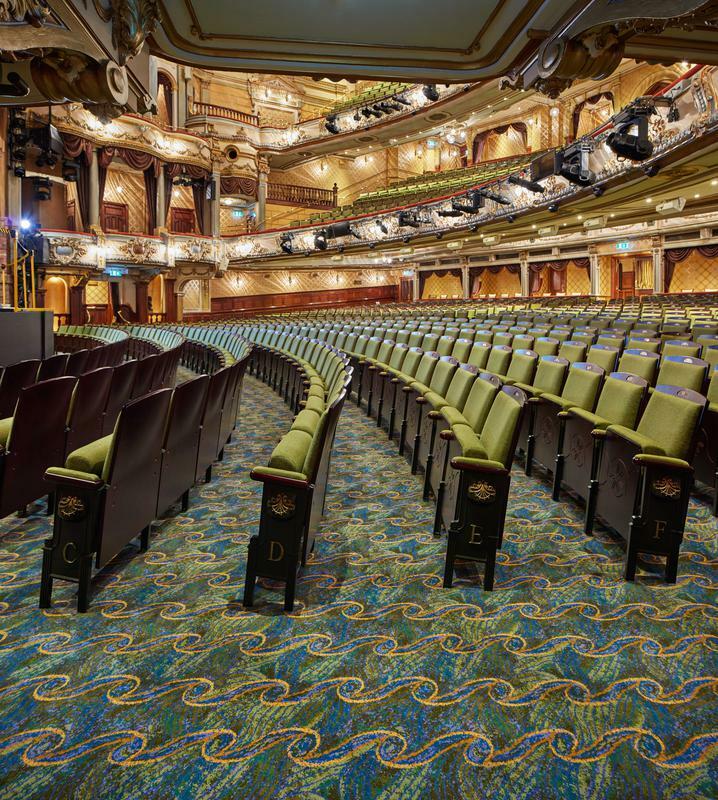 Brintons worked with award-winning interior designer Clare Ferraby to create bespoke carpets for the main public areas within the Victoria Palace Theatre. Clare Ferraby develops paintings that reflect the original architecture of a building. The challenge Brintons faced was to interpret the designs in a way that maintained their integrity and complemented the space. Brintons transformed the Grade II listed building by adapting Clare Ferraby’s hand painted designs into several repeat patterns. Jodie Hatton, Creative Designer, led the project for Brintons and worked closely with Clare to ensure that they were accurately reproduced, she created several different patterns using the swirling design from the original paintings, maintaining cohesion between each carpet through the use of similar shapes and colours. 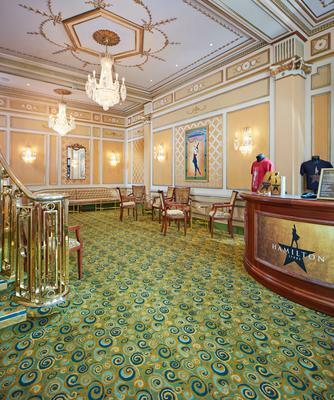 The green colour scheme was used despite its historically unlucky association in the theatre, and features the theatre’s logo, which Brintons produced in carpet as a key motif. Renowned architect Frank Matcham designed the theatre in 1911 and it was the last great variety house built in the West End. 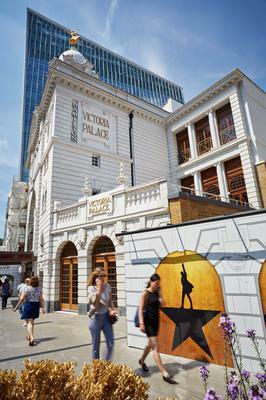 Whilst the contemporary designs contrast with the period the theatre was built in, the complexity of the patterns harmonise with the ornate décor of the interiors. 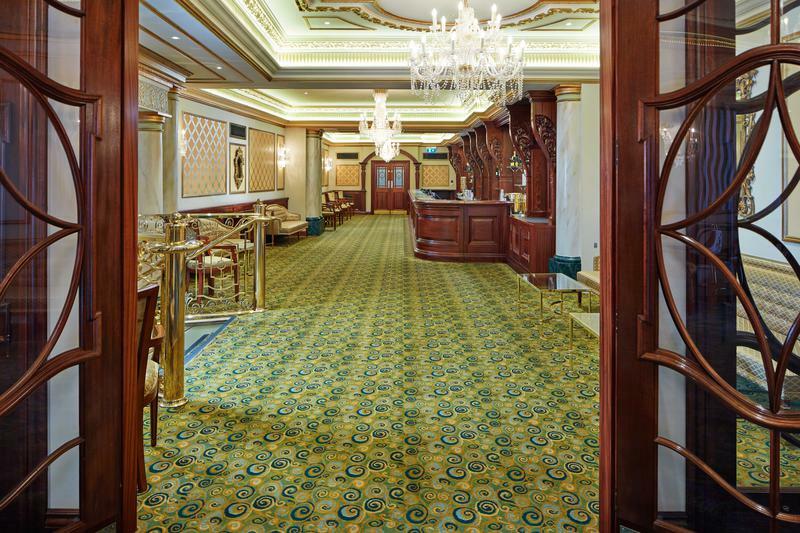 Brintons was a finalist for this project at The Campaign for Wool Carpet & Rug Awards 2018 in the Commercial Woven Carpet Design Installation of the Year category. The Campaign for Wool Carpet and Rugs Awards were created by the Campaign for Wool to celebrate quality, style and innovation in the wool and carpet industry. Now in its third year, the Awards event, held as part of The Flooring Show in Harrogate, North Yorkshire attracted over 100 entries from the flooring industry, each of which was judged by a panel of industry experts and editors from leading design publications on the basis of its technical, construction and design excellence and innovation and design. We have an established working rapport with Brintons Carpets, both in our own work and on projects with interior designer Clare Ferraby. 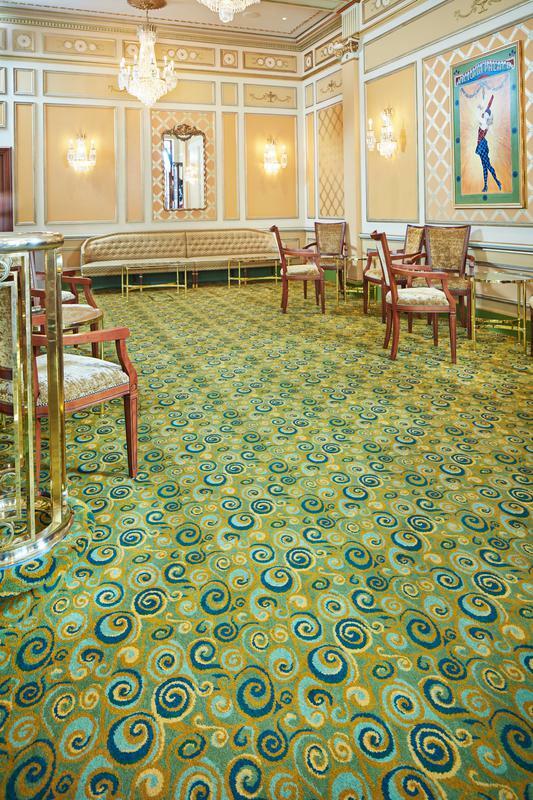 Clare Ferraby has designed all the carpets for the Delfont Mackintosh Theatres portfolio - which have all been designed with Brintons. The creativity and specialist knowledge of the Brintons team was invaluable in this process.